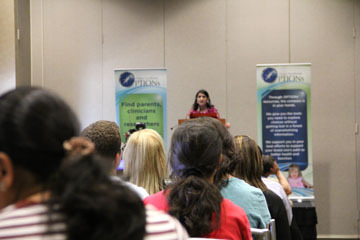 Dr. Erica Peirson gives the introductory speech to the Down Syndrome Track at Autism One. 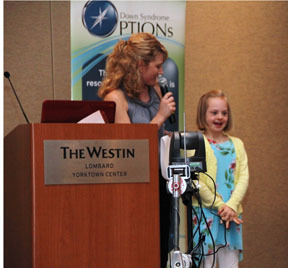 What does Down Syndrome OPTIONs do? Watch and find out! With proper intervention—physical, nutritional, neurodevelopmental, medicinal and environmental—your child's future can be full of opportunities instead of obstacles. How do I balance it all? This talk gives helpful tips for maintaining balance while juggling therapies, doctor appointments, food restrictions, other children, marriage and self. What are the possibilities for my child? Lydia is in 4th grade and will share a slice of her life with you. Do you know if your doctor is familiar with the American Academy of Pediatrics guidelines for screening for hypothyroidism in Down syndrome? Do you know how to communicate with your physician regarding thyroid testing and treatment? We want to help you better communicate with your physician. Lydia is 11 years old. She's a full-time student, sister, daughter and friend. She loves to play basketball, go on vacations, spend time at Camp Tekawitha and hang with her friends and family. Jane Winans shares her trial and errors, humor and wisdom in dealing with life’s stressful moments (years!). This is an inspirational presentation of how the birth of her child with T21 changed this Occupational Therapist's perspective on therapy. This talk will educate participants on current and optimal dietary options to ensure better overall health for their child with Down syndrome. The impact of diet and different methods on how to transition children with Down syndrome to solid foods will be discussed. Oral motor and feeding treatment methods will be explained as well as the importance of using these methods in order to develop a strong foundation for feeding skills and the development of speech. What is Craniosacral therapy? How does it work? Is it helpful to the DS population? Alison Wimmer explains the fundamentals of neurodevelopment and why it works beautifully with the holistic approach to DS treatment, allowing children with developmental challenges to succeed and exceed expectations. Why is the use of a baby-led weaning approach an optimal way to introduce solids to babies with Down syndrome? Baby-led weaning is a child directed feeding approach that exposes babies to a variety of healthy food choices, allowing them to develop their own food likes and dislikes while simultaneously developing strong oral motor skills and feeding skills. Baby-led weaning also encourages and further develops fine motor and self-feeding skills. This lecture will address implementation and healthy feeding choices that can positively impact the health of children with Down syndrome and their families. GAPS™ (Gut And Psychology/Physiology Syndrome) shows the underlying cause of some of the symptoms that plague special needs children, such as digestive issues, malabsorption, food sensitivities and toxicity. This session will explain how the state of the gut directly affects the health of the body and how the GAPS™ nutritional protocol can heal or greatly improve many of these symptoms. Parents deal with gut issues on a daily basis. Many parents of children with Down's Syndrome deal with the same GI problems experienced by those with autism. Digestive enzymes from non-animal sources can often improve many problems associated with food intolerance and malabsorption. This lecture will help parents understand what enzymes are and how they work in digestive health. Can nutritional supplements benefit individuals with Down syndrome? Kent MacLeod will review the history of supplementation in Down syndrome, and discuss recent advances in nutritional science and how those innovations can be used to positively impact the biochemistry of Down syndrome. Dr. Schwartz will review the history and scientific research documenting the benefit of nutrient and thyroid support in Down Syndrome. He will explain low risk, high gain interventions to: optimize nutrition and supplementation; monitor and support thyroid; choose first line, functional lab tests; avoid environmental toxins; and support detoxification. These are the building blocks needed to form a solid foundation upon which your child may flourish. Comparative effectiveness research depends upon a group of objective, independent predictive biomarkers. A current state of the art in regard to evidence based predictive biomarkers will be presented and discussed. This talk will present biologically based evidence that children with Down syndrome are uniquely susceptible to injury from vaccines. With an 18% ASD comorbidity, we will explore the mechanisms that may connect vaccines to autism in this highly vulnerable population. The relationship of vaccines to Alzheimer’s will also be discussed. Layman’s terms will be used to explain the folate cycle and its implication to the health risks for a mother with a Down syndrome child. Topics to be discussed include: depression, heart disease, Alzheimer’s, cancer and risk for having a child with autism. Strategies to minimize these risks will be presented. Dr. Anju Usman will explain biomedical techniques for optimizing a healthy gut-brain connection including uncovering roadblocks to function as well as introducing nutrients for brain repair and neurogenesis. Dr. Baggot, OB/GYN and medical geneticist, shares a method to enhance brain development before and after birth for babies with Down syndrome. Brain development is driven by changes in methylation of DNA and histone proteins which combine to provide epigenetic regulation. Methylation depends upon methionine synthase and vitamin B12. B12 status in the brain is distinct from the rest of the body, and brain levels of B12 are markedly lower in autism, schizophrenia and normal aging. Recent studies of the epigenetic effects of gluten and casein-derived opiate peptides indicate their significance for development and life-long disease risk. What is epigenetic regulation of gene expression, and why is it particularly important in brain development? This presentation will provide a fundamental understanding of epigenetics, focusing on the specific implications of chromosome 21 trisomy. Dr. Russell Jaffe received his BS, MD and Ph.D from the Boston University School of Medicine in 1972. He completed residency training in clinical chemistry at the National Institutes of Health (1973 – 1976), remaining on the permanent senior staff until 1979. He is board certified in Clinical and Chemical Pathology. As a physician and scientist who aspired to be comprehensive, objective, empiric and experiential, Dr. Jaffe started his career searching for deeper understanding, wisdom, evidence and insight in mechanisms of health. Learn and discuss fun ways to help your child read, do math, socialize, and play. Explore simple, logical strategies and activities which will increase overall retention of the information being presented. Sometimes the best teaching strategies are the most obvious.